A sterling showing in the second quarter has made economists more upbeat over Singapore's full-year growth prospects, even as they expect slower growth from manufacturing. The view of 19 private sector economists and analysts is that the economy will expand 2.9 per cent this year, up from their forecast in June of 2.3 per cent. 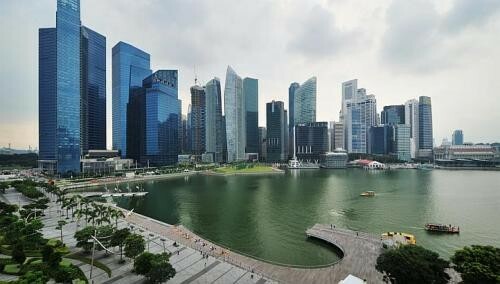 The poll was conducted by the Monetary Authority of Singapore (MAS) and its results are near the middle of the Government's recently revised growth forecast range of 2.5 to 3.5 per cent for 2013. "Robust services growth and a weak manufacturing recovery have led to growth upgrades," said Bank of America Merrill Lynch economist Chua Hak Bin yesterday. Second-quarter growth came in at 3.8 per cent, the highest rate since 2011 and far ahead of economist expectations of a 1.5 per cent expansion. But experts caution that the recent emerging market crisis affecting Asean, especially Indonesia, could dampen growth here in the final months of the year. "The key question is whether volatility in regional currencies will drag down demand for goods and services... the impact so far is still muted," said CIMB regional economist Song Seng Wun. Growth here is expected to come in at 4 per cent in this quarter, higher than the 3.5 per cent seen in the MAS June survey. Economists anticipate next year will see expansion of 3.5 per cent, with inflation at 2.9 per cent. The picture seems brighter for the services sector this year than for manufacturing and exports. According to the MAS poll released yesterday, economists expect manufacturing to expand by just 0.2 per cent this year, far lower than their earlier estimate of 1.2 per cent. Non-oil domestic exports are now tipped to contract 0.5 per cent instead of expanding 2.5 per cent as seen in the June survey. In contrast, the finance and insurance sector is projected to expand 10.6 per cent instead of growing just 6.1 per cent. Economists also predict that wholesale and retail trade will grow by 3.5 per cent, almost four times their previous prediction. "Financial services are leading the recovery, but there are also encouraging signs in wholesale trade and transport services," said Dr Chua. Services account for about two-thirds of Singapore's overall economy while manufacturing makes up about a fifth. Manufacturers say the emerging markets turmoil, especially in Indonesia, has cast some gloom on the sector, but they are still looking at a second-half rebound. "The mood's not as positive as before because of this sudden change," said Singapore Manufacturing Federation honorary secretary Moh Chong Tau. The inflation outlook has improved due to subdued car and housing costs, with economists expecting it to come in at 2.5 per cent this year instead of the 2.8 per cent noted in the June survey. "The cooling measures have worked," said OCBC economist Selena Ling. Core inflation, which excludes private transport and accommodation costs, is now expected to be 1.9 per cent this year, a tad higher than the previously tipped 1.8 per cent. The Singdollar is also expected to weaken further against the greenback from $1.25 to $1.27.